The picturesque town of Looe, on the South Cornwall coast, is having a very West Country event this week. Local writers, historians, naturalists, photographers, even fishermen, are gathering at the annual Looe Literary Festival to speak on their latest books, tell tales of historic smuggling, exhibit photographs of the beautiful Cornish landscape and journey into world of Victorian railway expansion. All the speakers at the Looe Literary Festival have a connection to the town, South Cornwall or Devon. Among them are Paul Greenwood, a local fisherman, and Sue Kittow, a journalist, sailing correspondent and author of a collection of Cornish walking guides. Lord Owen, formerly David Owen, will be talking about the impact of Brexit on British foreign policy. He was born in Plympton, a suburb of Plymouth. Also coming from Devon is Adam Hart-Davis, who will be speaking about his latest book, Very Heath Robinson, on the closing day of the festival. Heath Robinson had a West Country connection of his own. In 1935 he was commissioned by the Great Western Railway to celebrate its centenary with a book of humorous drawings. Entitled Railway Ribaldry, it covered the whole of the line from Paddington down to Dawlish and beyond. Anyone travelling into South Cornwall by train will pass over the Royal Albert Bridge at Saltash, built in 1858 by I. K. Brunel. 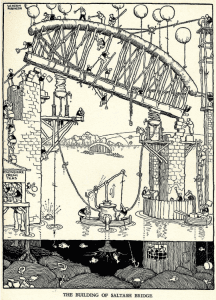 Heath Robinson drew a marvellous picture of the bridge under construction which appears in Adam Hart-Davis’s book, with a description of the heroic engineering feats involved. You can still get all the way to Looe by train, taking the scenic Looe Valley Line, run by the G. W. R. to this day. 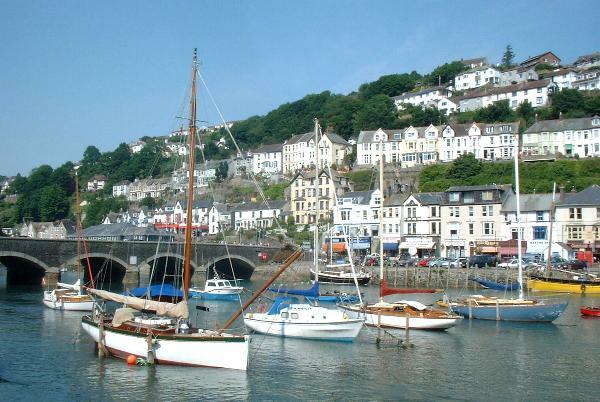 Looe lies at the mouth of the Looe estuary, an area that is frequently flooded. 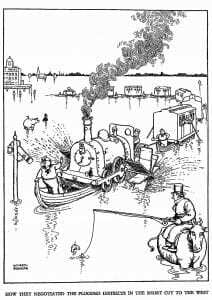 Heath Robinson, in Railway Ribaldry, depicted how the G. W. R. might have negotiated this hazard, with steam engines embarked on rowing boats, equipped with paddles and staffed with bo’suns. Adam Hart-Davis will speak at 3 p.m. on Sunday 19th November, at the Millpool Centre in Looe. Tickets are £10 and are on sale until 18th November. To book, click here. To find out more, visit Looe Literary Festival.